Canada has picked up another silver medal at the Winter Olympics in PyeongChang. This time it’s from snowboarder Laurie Blouin in women’s slopestyle. Poor weather cancelled qualifying runs yesterday, with organizers moving to a more abbreviated competition today. After a poor first run earned her a score of 49.16, she needed to do more with her second (and final) chance. The 21-year-old from Stoneham, Quebec scored 76.33 in her second run, good for second place. American Jamie Anderson won gold (83.00), while Enni Rukajarvi (75.38) took bronze. Blouin’s medal is the third won by a Canadian snowboarder in slopestyle in these Games, with Max Parrot and Mark McMorris capturing silver and bronze respectively in the men’s competition yesterday. Like McMorris, Blouin wasn’t sure if she was going to be able to compete. 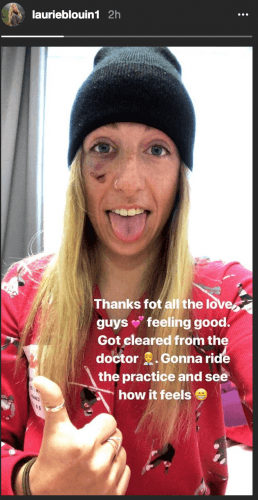 Blouin was taken to hospital three days ago after she went down hard when her snowboard got stuck in a crack after landing a jump in training. Clearly she wasn’t bothered by the black eye. Canada’s medal total is now up to six (1 gold, 4 silver, 1 bronze), the second-most of any country at the Olympics so far.